This doesn't feel right. . . this bike should not be this easy. Five minutes after picking up the Triumph Speed Triple I find myself questioning whether this really is a litre class naked motorcycle. An open stretch of smooth, wide and narrow straight tarmac looms ahead. I'm hesitant, the temptation to smack the throttle open is overwhelming, but I have been pulled over for doing just 80kmph on this road only a month earlier. 70kmph is a torturous speed limit to hold onto, but then again, maybe if I just use first gear all will be okay. A quick scan of the mirror indicates all is clear at the rear as well. I move to the side, slow to a crawl and then whack it as hard as I dare. Oh. Dear. God. From 1,000 to 3,000rpm the bike feels surprisingly dull, then, post 4k rpm a strong surge begins. As the motor crosses 6k the Speed really begins to light up. The exhaust starts to snarl aggressively and suddenly I feel the front wheel go light and begin to skim the surface. My knees instinctively clench onto the large but perfectly proportioned tank as the bike seems to want to tear itself away from my arms. 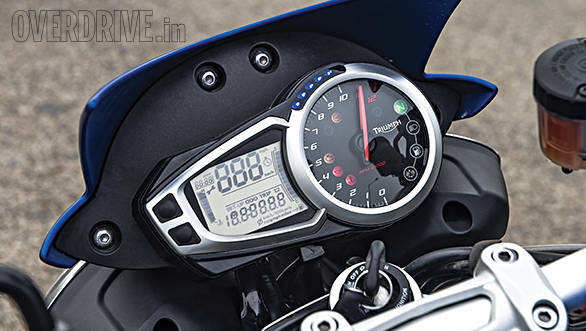 Before I know it, the Triumph has screamed to its 10k rpm redline and the dial has crossed over into triple digit speeds. Whoops; I quickly roll off the throttle and am treated to Triumph's signature barrage of crackles and pops from the exhaust as the Speed descends into wallet safe speeds. So that settles it. 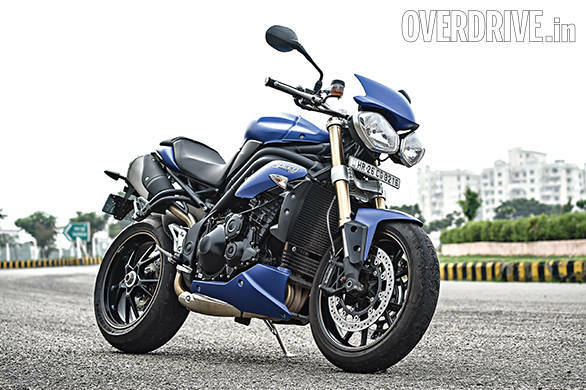 The Speed Triple 1050 is every bit a proper litre class naked. 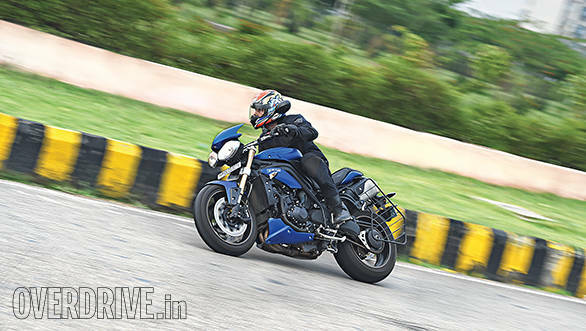 For those of you wondering, 0-100kmph should take just about three seconds while the Triumph has a top speed of around 230kmph. At this point you must be wondering what the confusion was all about. Here's what caused it - the Speed feels much smaller, more agile and easier than it should be. In fact both Rohit and I found it similar to riding a bulked up FZ16 in traffic, maybe even easier given the extra power for easy overtakes. Two minutes on this bike and you'll find yourself filtering through heavy traffic without a second thought. Perhaps the only thing some of its rivals do better is pull from lower revs. A similar four cylinder litre naked will be happy to accelerate from 40kmph in the sixth but the Triumph will grumble vociferously at anything below 60kmph. But then the ergonomics make up for it - it's a sporty riding position, but not overwhelmingly so. So your feet are folded up a bit and there is a definite weight bias on your wrists but it's actually quite a nice compromise between comfort in the city and commitment on your favourite stretch of twisties. The seat height though is surprisingly high. Not a problem for me but shorter riders will find their toes stretching out when coming to a halt in traffic. Part of the Speed's easy going nature is its suspension setup. The bike is firm without a doubt, but the suspension also has a pleasant suppleness that absorbs reasonable amounts of irregularities in the blacktop. 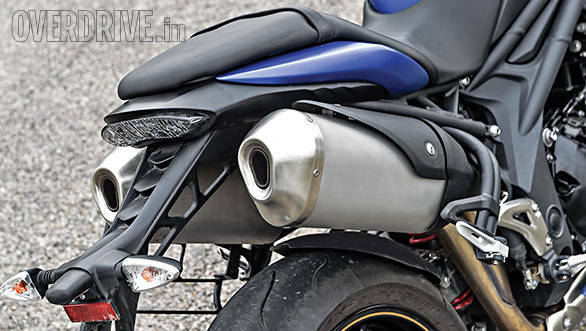 You'll still need to stand on the foot pegs over the harsher stuff and it will occasionally pitch you out of the comfortable seat over bigger bumps at high speeds but this bike is nowhere near as harsh as its greener rival. The same suppleness helps iron out mid corner bumps as well. We didn't find too many corners on our shoot but from what we could tell the bike enters corners quickly, confidently and feels stable and accommodating to small corrections. Again, she may not be as razor sharp and aggressive on corner entry as a Z1000 but instead offers an eagerness that will encourage you to push your personal limits without scaring yourself. And for a motorcycle designed to spend a majority of its life on the street that's not a bad thing at all. 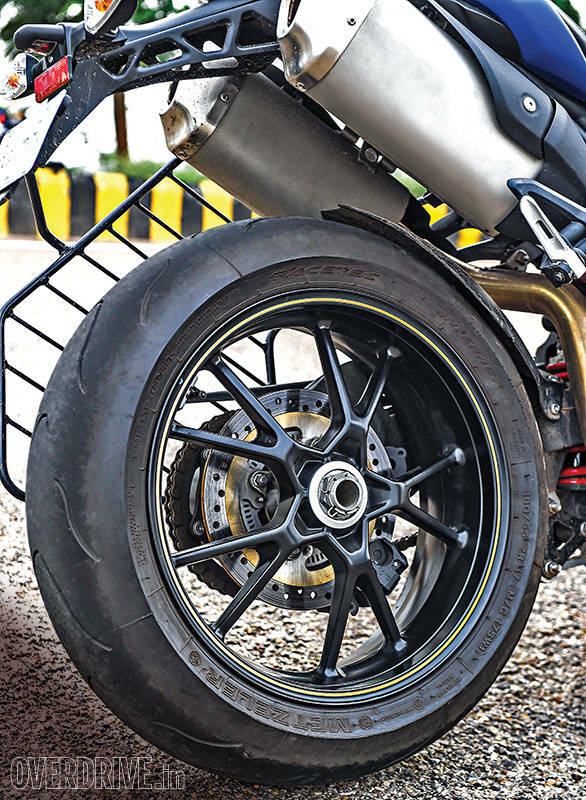 The ABS equipped brakes offer mighty stopping power, but in keeping with the theme of the bike, don't feel overwhelmingly sharp or snatchy. 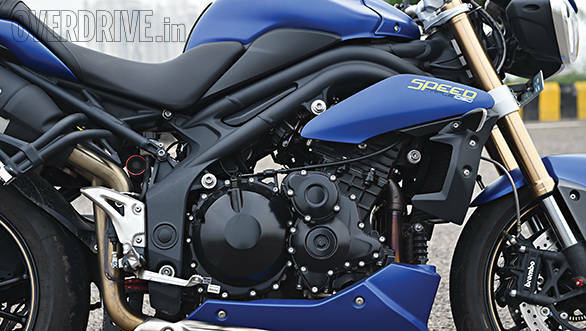 The Speed has styling quite similar to its smaller sibling, the Street Triple. But where that bike's styling is interesting bordering on awkward the Speed, we think is a much more handsome looking bike. Sure, the satin blue paint job looks great but it's also the small details like the funky fly screen, belly pan and underseat pipes that add up. But our single favourite design feature has to be that lovely single side swingarm that exposes the handsome rear wheel. Of course getting rid of the terribly ugly government mandated saree guard is a matter of undoing a few bolts and that will probably be the first thing you'll do. After a fun day with this bike it was pretty clear that the Speed Triple is much more than the sum of its parts. The 135PS/ 111Nm 1050cc in-line triple may not have the same pedigree, sky high redline or peak power as some of its four cylinder rivals but it offers blistering performance that will keep you entertained for a long time. It may not be the sharpest litre naked out there, it may not even be the fastest but the Speed Triple offers a rare and wonderful blend of real world ease and useability with mind bending performance when you ask for it. And being a CKD, it also costs a fair amount less than some of its CBU rivals. It is without a doubt, one of the sweetest litre class nakeds available today. The Street Triple did feel special to ride but I do remember Shumi saying that the motorcycle felt a bit slow and lacking in punch for a 105PS motorcycle at the time. 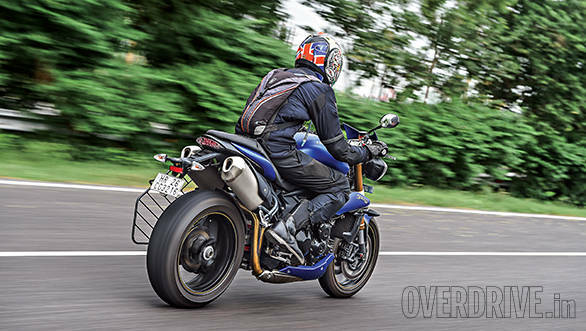 But while the new power figures do rob the motorcycle of some shine as far as my memories go, the fact is that at Rs 8.50 lakh on-road Pune, the Street Triple is no longer the deal we thought it would be. The Kawasaki Ninja 650 makes just 7PS less for Rs 2.79 lakh less and the Kawasaki Z800 matches the price of the Street Triple roughly while offering a whopping 35PS more. In this situation, we believe there are far better deals you can spend on your money on than this Triumph.